Rosh Chodesh Shevat at Midreshet B’erot Bat Ayin was an incredible experience. It inspired me to write the following eating meditation, which is also based on the teachings of the Arizal. I hope to take advantage of the special opportunity during the month of Shevat to work on eating in holiness. I hope that the many classes I am scheduled to give during the month of Shevat about Eating as a Mitzvah the Torah way (click here for more details) will inspire me to work on my own eating for the sake of Hashem. In this week’s Parasha we learn about the manna that the Jewish people received directly from Hashem during their wandering in the wilderness. The Talmud states that eating the manna was a spiritual preparation for receiving the Torah less than two years afterwards. “The Torah was only given to the generation who ate Manna…” What is the connection between eating manna and meriting Torah? Abarbanel explains that by eating manna, the children of Israel were constantly dependent upon Hashem’s mercy. By becoming accustomed to continuously thanking Him for His kindness, their faith would be strengthened. When we make berachot (blessings) over food with deep intention to really thank Hashem – the source of our sustenance – we likewise open ourselves to be a suitable vessel for all of Hashem’s abundance, including the Torah from Heaven. According to Rav Tzaddok of Lublin, the eating of Adam and Chava in the Garden of Eden was on a complete different dimension. The fruits in the Garden provided spiritual nourishment, the embodiment of the holy letters of the Torah. Therefore, prior to receiving the Torah – the Tree of Life – the ultimate rectification for eating from the Tree of Knowledge, the Jewish people needed first to return to eating spiritual food. The manna had no particular physical form. This is why it would give you whatever taste you desired. Manna, like the fruits of Eden is a physical form for supernal light. It includes no mixture of evil, since no evil descends from Heaven. It contained no waste; every spark of it was absorbed completely by the body. Based on a person’s spiritual level, the manna would arrive daily either far away in the desert or directly to the doorstep. Thus, the generation who ate manna gained awareness of their personal spiritual level, and learned to elevate their physical being to become a vessel for spiritual sustenance. In this way the manna was a perfect preparation for developing the vessel to receive Torah – our ultimate spiritual sustenance, elevating us once again to the level of ingesting the holy letters of the Torah. It is not coincidence that we read the Torah portion about the manna during the month of Shevat, and in the week of TubShevat. According to Sefer Yetzira, the month of Shevat is the time for rectifying eating – elevating the sparks. “For a person does not live by bread alone, but by everything that emanates from Hashem’s mouth.” While the body receives nutrients from the food, the soul ingests holy sparks “that emanates from Hashem’s mouth”. In order to elevate these sparks, we need to practice mindful eating in addition to working on reciting our blessings with deep intention. The TubShevat Seder, where we infuse eating fruits with reading Torah verses pertaining to them, is a special opportunity to rectify eating. With Hashem’s help, I will be celebrating TubShevat the special B’erot Bat Ayin way, and sharing with those of you who live in NY, Toronto, Florida, Memphis and Atlanta(click here for more details) Torah sources and practical guidelines how to elevate eating the Torah way. For those of you who are unable to attend any of these events, please try out the special eating meditation I have written for you below. Here is an eating meditation in honor of TubShevat. This week chose at least one meal where you will focus completely on eating as a mitzvah in the most conscious mindful way. Decide that during this meal you will not allow anything to distract you from working on eating in holiness. You will not be doing anything else while eating, such as checking your email, watching television, even “kosher tube”, reading or talking. Turn off your phone or make a conscious decision not to pick it up until you have completed your meal, and recited the appropriate after-blessings. You may choose to eat this special meal alone or in the company with others who are ready to share your silent eating meditation. Take a look at the food, look at its colors and the textures. Look at how it shines. Think about how all this food is a loving gift from Hashem. What do you appreciate about the food? What can you thank Hashem for in bringing you this food? Why is this particular food important to you? Now is the time to recite your berachot (blessings) before eating your food. Imagine the King of the Universe giving you the fruit of the earth – handing it to you directly as a present so that you may receive such blessings. Through this food you have the opportunity to attach yourself to the Land of Israel and to Hashem. Recite all your berachot slowly and with deep intention. Bless Hashem for being the Creator of your sustaining food, of the fruit of the tree, of the fruit of the earth, and for everything that came into being by His word. Take a bite of the appropriate food after each blessing and chew it really well, until it becomes liquid. Remember digestion starts in the mouth. Try to chew each bite 32 times corresponding to the 32 teeth and the 32 pathways of wisdom. As you chew remember to breathe and visualize how your table is aמִזְבֵּחַ – mizbeach – altar, and how your eating in holiness will be an atonement for any wrongdoing this week. Breathe through your nose, and continue to chew with intention, extending the life of the food in your mouth, extracting its sweetness and holy sparks. It takes a lot of self-discipline and you can develop patience by eating slowly and chewing every bite so many times. For me, it’s a work in progress. Enjoy the pleasure of the tastes and offer thankful thoughts to Hashem with every chew. Chose a Torah verse to recite and meditate on, in your mind’s eye as you chew. Meditate peacefully with your rhythmic chew, to unite your eating with Hashem – the source of all your goodness. When you are done eating recite your after-blessings slowly and mindfully. Sefat Emet explains that the reason why there is no Torah as the Torah of Eretz Yisrael, is that the food in the Land of Israel is prepared through the Mitzvot of the land. We merit Torah according to our level of eating in holiness. Therefore, on the Holy Shabbat, when eating the Shabbat meals, we merit more Torah. There are only two blessings directly from the Torah: The blessing before learning Torah and Grace after Meals. Our Rabbis established that we also recite blessings before eating. According to the Arizal, when we eat in holiness, we reveal new aspect of Torah. 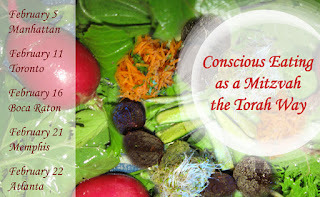 We absorb a spark of Torah consciousness with every bite of food. Therefore, just as the Torah requires us to recite blessings before learning Torah, so do we recite blessings before eating. The blessing that we recite before eating is actually a blessing for the Torah we are going to absorb from this act of eating.